The most unpopular piece of legislation imposed on motorcyclists in August 2008 by Westminster’s Conservative Councillor Danny Chalkley is still under experiment, as we have just entered 2010. Central London has, for the past 17 months, been the scene of enormous demonstrations against the ever unpopular motorcycle parking tax, and Westminster parking staff have been living a complete nightmare with thousands of bikers phoning in, sending emails and letters, submitting hundreds of Freedom of Information requests to express their disgust at how they have been treated by members of the Conservative Party, who have no ambition and purpose in life other than stealth tax members of the public to bring in some dosh and boost their career progression, while they exempt themselves from paying their own parking taxes. We know from the very beginning that the bike parking tax is nothing but a pure attempt to fill up Westminster Council’s coffers. The Council expects motorcyclists to park in over-crowded bays, without the promised security devices, and pay £1 a day or £100 per annum to use basic parking facilities which have not been enhanced in any way since the introduction of the charge. If you look at any motorcycle parking bay before and after the introduction of the tax, you will realise that not a single thing has changed, the bay looks exactly the same. So we wonder what on earth motorcyclists are paying for, if not making the wealthiest Borough Council in Europe even richer than it already is. The No To Bike Parking Tax campaign started in August 2008, immediately after the charge was introduced. The campaign started with demonstrations attended by 20 to 100 bikers to reach an amazing 7,500+ supporters at the time of writing. It was assumed at the time that a few demonstrations causing some disruption to Central London during rush hour would be enough to make Councillor Danny Chalkley reconsider his motorcycle parking tax. But no, despite receiving more than 3,000 written objections twice (in February 2009 and again in July 2009) to his motorcycle parking scheme, this man was more determined than ever to persue with it and even ignore his own residents who elected him to serve their needs and wants. He even used dirty tricks to intimidate campaigners and discourage them from exercising their legal right to protest. The campaign soon realised that demonstrations and objections alone were not enough to make Chalkley scrap the bike parking tax. As a result of Chalkley ignoring all emails, letters and objections sent to him, campaigners started to submit Freedom of Information (FOI) requests to Westminster City Council in an attempt to have their queries and questions answered. In the space of a few days, the Council found itself under a deluge of FOI requests, which all had to be answered within 2o working days, as required by law. As the number of supporters to the campaign was increasing, the number of FOI requests to Westminster City Council were also increasing to the point that the Council started to experience severe difficulties to cope with the volume of requests and broke the law on many occasions, by failing to answer within the statutory 20 working days. Many FOI requests were forwarded on to the Information Commissioner for investigation. But this is not all. While a number of FOI requests were specifically submitted to create additional work for the Council and delibarately put some of its employees under considerable pressure and stress, a fair proportion of them were designed to investigate the way the Verrus pay-by-phone parking system (which is the only practical method used to tax bikers to park), together with the Partnerships in Parking (PiP) scheme, were introduced in Westminster. The investigations revealed serious potential breaches of European Union law, mainly due to a lack of tendering process required to enable fair competition between suppliers across the European Union. Had Councillor Chalkley listened to motorcyclists, considered their objections in the first place and scrapped his bike parking tax as a result, such investigations might not have been taking place. Because of his ignorance, Westminster City Council’s parking strategy is now under examination by the European Commission (case number SG-CDC-2008A-7695 — GESTDEM 2009/5139) and the Office of Fair Trading (case number EPIC/ENQ/E/75795). In addition, thousands of bikers demanded on 7th December 2009 from the Department of Communities & Local Government (DCLG) a public inquiry into the way Westminster City Council used the funds granted to them at the time (and being tax payers’ money) to set up the PiP scheme, which is suspected to be illegal. The aim of all this is to have the whole Verrus pay-by-phone parking system in Westminster dismantled before it spreads everywhere else, under the potentially illegal PiP arrangements. As soon as the existing pay-by-phone parking system is dead, Westminster City Council will have no practical way to stealth tax motorcyclists for parking and bikers will be able to enjoy free parking again, as they have always done. And of course, this may be extremely bad news for Verrus UK Limited, which may lose substantial business because of Westminster’s negligence. But that’s not all. The No To Bike Parking Tax campaign is more determined than ever to make sure that the individuals who introduced the bike parking tax on potentially illegal grounds face the consequences of their actions. Even if the tax is scrapped before expiry of the existing experimental traffic order (4th February 2010), it is too late to stop the EU Commission’s and Office of Fair Trading’s investigations, which could potentially make Westminster City Council liable to severe penalties. But the campaign is dying for Councillor Chalkley to make his bike parking tax permanent before 4th February 2010, so that they can lodge papers in the High Court, and exploit the awakening media interest in the run-up to the general election. This could be very painful for Chalkley and his chums. We believe it’s always best for politicians to listen to the public, serve their needs and wants, otherwise the same public have the power to make the life of politicians complete hell and ruin their career. Don’t forget that the UK Government must reply to the EU Commission by no later than 20th January 2010. I wonder what sort of Christmas these Westminster politicians had this year! A big round of applause to those who uncovered all the Westminster’s dirty tactics. 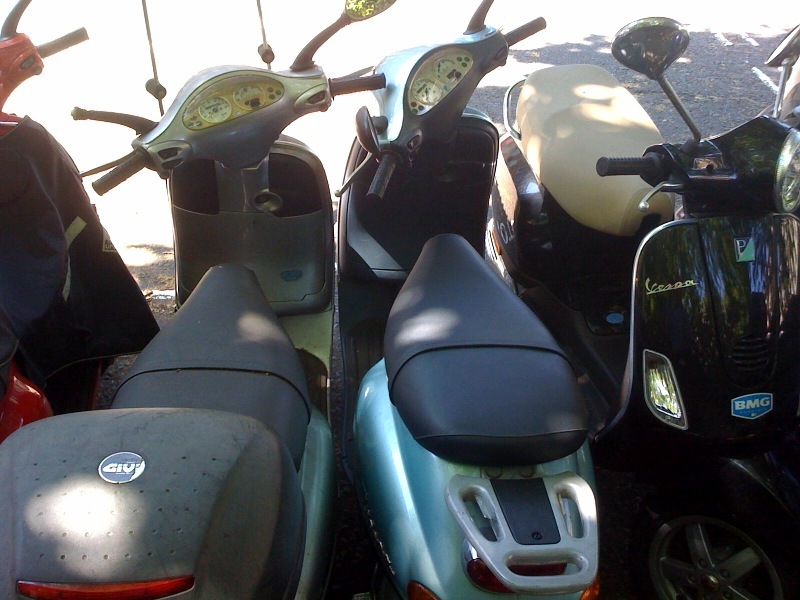 The photograph of those mopeds jammed together in that motorcycle bay sums up motorcycle parking in City of Westminster. I’m fed up of coming back to my bike to find it damaged. The unlawful motorcycle parking charges must be abolished! Having had a ride around Westminster lately, I have noticed that most motorcycle bays paying parking signs have been defaced so parking is now free in those bays. Motorcyclists are fed up with waiting for a “decision”, and by the looks of it have taken the law in their own hands and who can blame them for it ? I have even seen car parking signs being painted over now, the idea seems to be catching on. Westminster should have never started to charge bikes. Is this the start of a London wide rebellion started because of Westminster City Council bike tax ? 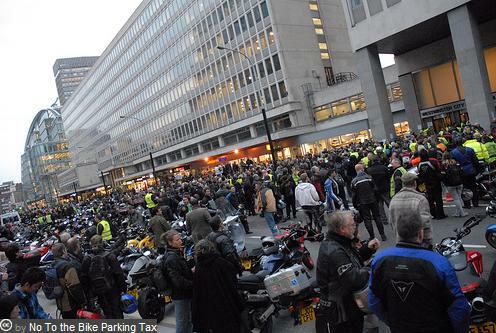 « Bikers have suspended Westminster’s parking tax!